FR39 between Joseph and Hells Canyon goes over three summit points. The highest one, also the one closest to Joseph is Salt Creek Summit. There is no sign at the top, and it is not marked on many maps. But signs in the area refer to it by this name. The most memorable thing about this summit is the sheer size of the descent to the bottom of Hell's Canyon. Many maps advertise a 5000ft drop at this place. But the drop in the road does not quite reach that figure. From West. 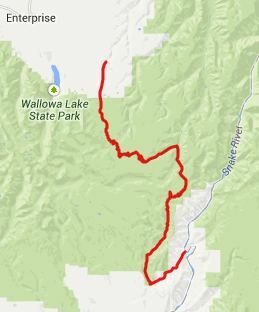 The turnoff from Wa350, west of Joseph onto the forest road is signed "Wallowa Mountain Road". One can get an idea of the surrounding mountains for a short time, after the road crosses into the National Forest. It looks more like a timber management area. After that the road stays in forest until after the 3rd summit. The climb to the first and highest top seems to stretch forever as there seems to be always just a little more shallow hill to go. At the top is the signed turnoff to FR3940 to Hart Butte, as well as the "Salt Creek Summit Recreation area". I think it's a fishing pond. From East. (described downwards) After the first shallow downwhill the road soon starts climbing again and reaches a second summit, very similar in appearance to the first, except here FR3930 and another forest road join the paved road. The two are so similar that I completely forgot about this point during the way back, on my out and back ride. Using paved roads the western side of this second summit is just under 500ft tall. But one could find a larger approach using dirt roads. Continuing on the profile, the road descends to the Imnaha River in a long downhill with one or two switchbacks, and innumerable smaller turns. The dense forest in this peaceful valley has two organized campgrounds, in addition to the plentiful other camping opportunities. The climb to the third summit (I'll call this one FR39 s(u)-2 soon feels quite a bit steeper than the other two. If one wants to see what's behind all those trees, the turnoff to the Hell's Canyon Overlook (see Hell's Canyon Rim Road s(u) ) proves irresistible, and worthwhile too. Once over the last and lowest summit point, the road actual breaks out of the trees for several turns, and you can see a sliver of a ridge, crested by an outline of trees to the west. But soon the road is in forest again following Gumboot Creek. The road is shallow enough that the bike just rolls along perfectly on its own, no breaks required, and pedaling would not bring much either. Several miles before exiting onto Or86 all this public land freedom is over, and the road crosses land owned by a private ranch. Surprise, Or86 at the next junction is a regular road - not some isolated canyon track. Here cars go the speed limit again, and this takes a while getting used to after all that peace and quiet. The profile descends all the way to the bridge over Hell's Canyon at Copperfield. Calling it a canyon here is somewhat misleading. There is no drop left down into it. The canyon is above, and the river is really a damed lake, used for power production. Copperfield has a a campground with perfectly manicured, green lawns, as well as housing and churches for people who keep up the power generation, dams and lawns. FR39 s(u) - 2 x2 : lower part of FR39 in Hell's Canyon rec area <> FR39 s(u)-2 <> turnaround point jct with FR3965 to Hell's Rim viewpoint (connecting to previous ride) >> separate out and back down FR39 <> Copperfield <> turnaround point several miles after Copperfield on east side of river: 64.7miles with 4800ft of climbing in 5:21hrs (VDO MC1.0 m5:13.9.18).